Hello lovely crafters. This post is a very quick one, because it is 01:30 and I only got back from A&E a couple of hours ago. DH and I had been up there from 17:00 to 23:30 and hadn't even eaten since breakfast, but I was about to post this card before we had a mercy dash on. To cut a very long story short, my dear mother had to be taken to A&E for a very nasty infection, and they are keeping her in overnight! 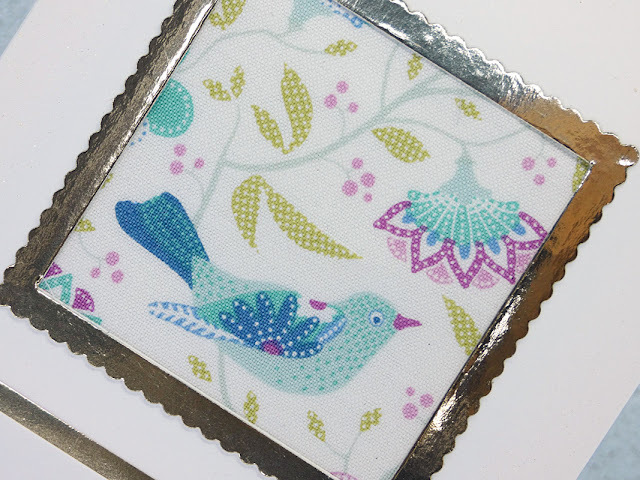 This card was made with a small square of fabric that was sent to me as a sample when I purchased some batting for a bag. And it was too pretty to just throw away, so I just framed it with a gold foil frame and stamped and embossed a sentiment to coordinate. I'll leave you with the pictures, whilst I go off to bed (early for me, but I'm shattered). Have a great week everyone. That's me signing off. 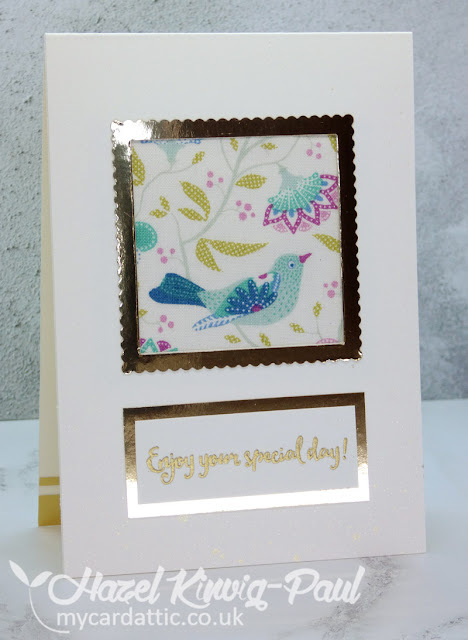 Very Pretty card ! I hope your mother feels good soon ! What a lovely piece of fabric! The shiny paper looks great too. I do hope your mother feels well soon. wonderful card, Hazel - hope Mum is better soon. Hazel, so sorry to hear about your Mother, sending prayers that she has a fast recovery. That is a lovely square of fabric for sure, so glad you popped it on a card, the gold framing is perfect. Ooooh, I do hope your Mum gets better very quickly. I know it's worrisome when our parents are in distress, so I hope this passes soon. Your card is so pretty. I can certainly see why you kept that pretty piece of fabric. I would have done the same! I hope your mum is better now. How scary! 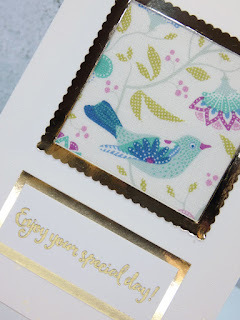 I do love your fabric card! What a beautiful piece of fabric and a perfectly elegant way to use it! Upcycling makes me very happy, especially when the result is as pretty as your card! Hope your mum feels better soon! Sorry to hear about Iris. Hope she is feeling better by now (I'm late with my commenting, as usual!). What a scary time for all of you. What a perfect way to use that gorgeous piece of fabric! I love how the CAS card keeps the focus on it. I hope your mother is doing better! So sorry to hear about your Mum Hazel and I hope she is on the mend by now. 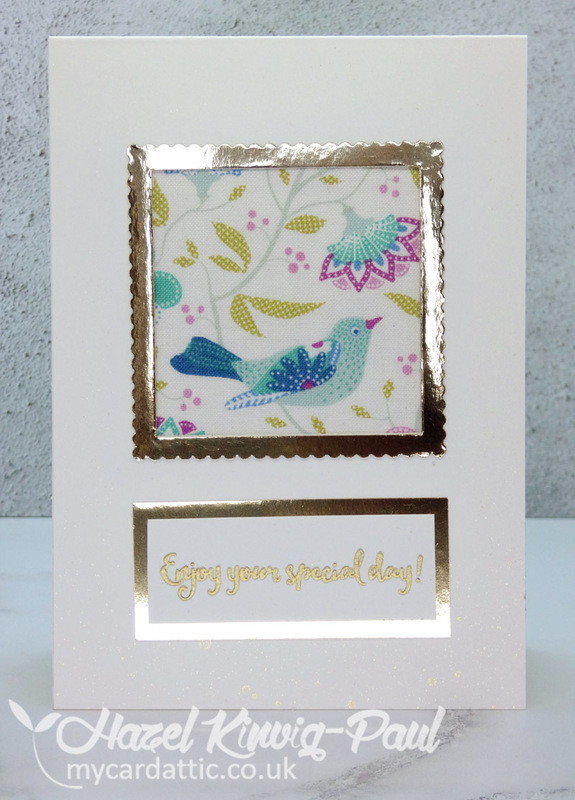 I can see why you couldn't part with that fabric - it's gorgeous and makes a lovely centrepiece for for your card. This is gorgeous Hazel ! 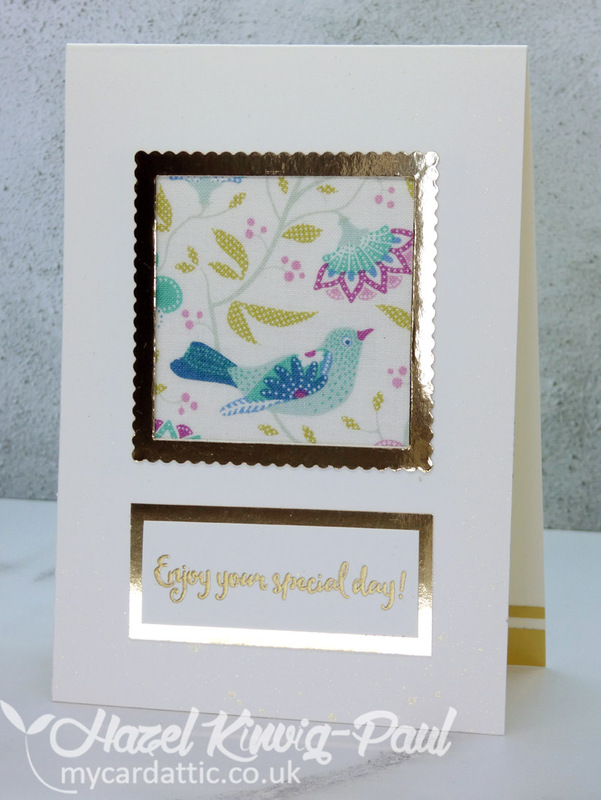 I love that you used this beautiful piece of fabric and let it take center stage on your card. Gorgeous Hazel I like the touch of glimmer. I just love your idea here... such a cute piece of fabric.